I am looking for some ideas and thoughts please. I am planning on decorating a new home office and would like it to be energized for creating business wealth and be a place where creation of new ideas and writings can happen. It is placed in the North West of the building which faces due South . I would like the groups thoughts on using Red on the West and East walls. Most of the North wall has a triple glass door pointing due North. All the other walls have doors and no windows. We could paint the South wall or leave it in natural stone, which I like the idea of as it brings grounding. This is a question often asked by interior decorator who want to incorporate feng shui into their work, so I will try to answer your specific question but at the same time try to set out the feng shui principles relating to colour selection. 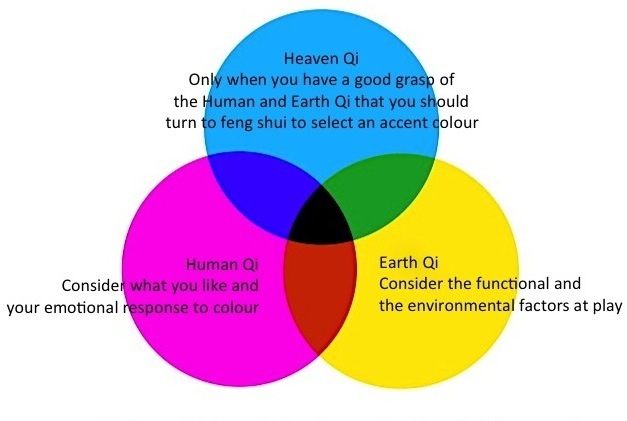 Colour selection based on feng shui principles need to be considered on the three San Cai levels of Tian (Heaven), Di (Earth) and Ren (Human). The Earth level is the environmental and functional input. Your home office is located to the south so it is the warm side and an office needs a cool atmosphere to concentrate and to make decisions, so the tone of the chosen colour should not be too “hot”. The Human level is the psychological level and what you would like, if you like a natural stone colour because you feel it brings grounding, then chose a natural stone hue with a cool tone. The Heaven level is the feng shui input based on the Gua Qi (qi of the trigrams) and Wuxing (Five Elements) relationships. In your case because you are not using any compass methods, then we can just use the general and non-specific Luoshu correlations. In the Luoshu diagram, West is correlated to the Dui trigram and is associated with Metal, so using red Fire will fight it and you should avoid it. East is correlated to the Zhen trigram and is associated with Wood, so using red Fire will deplete it and you should avoid it as well. There are also other Feng Shui methods you can use to select an accent colur to be ritually correct, and it can also be based on you Four Pillars of Destiny, but you will need a Feng Shui practitioner or a Bazi expert to guide you on that.